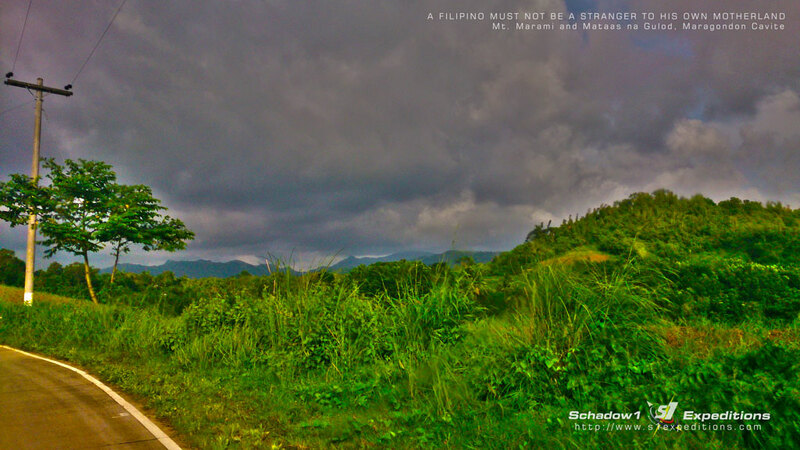 Mount Marami is located at Maragondon, Cavite to which the jump-off starts at Magallanes, a neighboring town of the same province. Marami is actually a cliff-area of Mount Mataas na Gulod to which its elevation is 510 633 MASL as compared to its real summit at around 622 642 MASL. The feature of the hike would be crossing 2 major rivers and mountains before you can reach the summit. This is an account of Schadow1's solo attempt of scaling Marami and its mapping expedition as typhoon Maring (intl. Trami) looms. It is early Saturday morning, a long-delayed climb to Mt. Marami that was planned several months ago which became a reality by that day. The weather prior to Saturday is promising. A low pressure area is detected near Batanes which meteorologists thought to have only 40% of developing to a tropical storm. A good window for a dayhike to Mt. Marami for a follow-up mapping expedition that was initiated a month ago by a fellow mountaineer/mapping advocate, Alain Orlanes. Mt. Marami is a cliff area of the more prominent Mount Mataas na Gulod located at Palay-Palay and Mataas na Gulod mountain range of Cavite. The hike features a long 9.5-kilometer trek from the major jump-off at Magallanes, Cavite. To which you need to cross 2 major rivers, valley in between 3 mountains, graze lands and a forest. There are many trail marks used by the locals that may confuse hikers. Mt. Marami's hike is almost similar to the more famous and higher Mt. 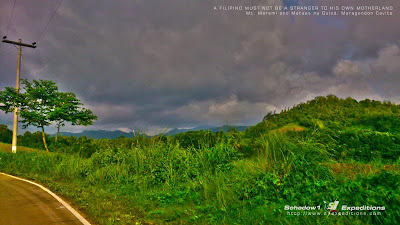 Pico De Loro (664 MASL) and is also from within the same mountain range. What made Marami unique on its own in comparison of its bigger brother is that the trail is slightly longer and the Marami cliff gives you a central view of the of the mountain range in Cavite as well as a 360-degree view of the mountains of Cavite and of Batangas, specifically Batulao and Talamitam. Quite unaware of the once harmless LPA, I proceeded on my first solo mapping expedition to Marami. Typhoon Maring (int'l Trami) has developed to a tropical storm while at the middle of the trail. The weather started to become gloomy and the rain clouds has engulfed the view. The hike starts on muddy trail and its seems there were no other mountaineers who went ahead of me as all I can see are footprints of horses used by locals. The valley to Marami is primarily a graze land to which caretakers usually visit their livestock using a horse as their means of transportation. 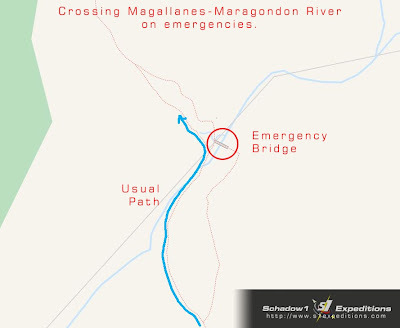 After 1.3 kilometers of a gradual ascent and descent, the major river bordering the towns of Magallanes and Maragondon has been reached. The river needs to crossed by foot as there are no bridges around. As I crossed the river, it is almost knee-deep. From the river, you would continue on an alternate yet still gradual ascent and descent, passing through muddy graze lands and streams. 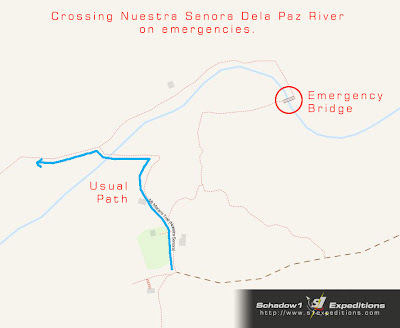 You will finally exit to a wider track which is used by horses and probably by 4x4 vehicles to which the end point of the track is the Nuestra Senora Dela Paz Chapel at 181 MASL. The chapel's ground is the valley between Mataas na Gulod and a lower elevation mountain. This wide trail starts at Barangay Talipusngo (a farther barangay which is two barangays away from Ramirez) and ends at the Nuestra Senora Dela Paz Chapel. A testament to how muddy the trail to Mt. Marami is. The chapel is a pilgrimage site by Catholic devotees and most of the time, no one is around due to its accessibility. And the chapel's garden can be used as a campsite. A water source is also available in a form of a deep-well faucet (poso). I have reached this chapel at 9:30 AM and stayed for 45 minutes to let the rain stop. A campsite along the the chapel side. At the back of a chapel is where you need to descend to reach the second river which you need to cross. The river is quite narrower and more shallow than the first river and is the river that separates the Nuestra Senora valley to Mataas na Gulod. The 2nd river is shallower than the first major river. The challenging ascent will start from this river which you would be ascending and descending a couple of times until you reach a mid-mountain grazeland. At the middle of the trail in Mataas na Gulod is a small hut (the last hut on the trail) used by Mang Demy to take care of his cows along the area (364 MASL). He is from Magallanes town proper to which he climbs to this graze land once in a while. There is another campsite at 427 MASL to which beyond it is already the start of the steep ascent to Mataas na Gulod. More cows. The campsite... err... cow's site. The area is foggy however I was short of breath. Realizing that the fog is not composed of water vapor and oxygen (where it usually is) but possibly of nitrogen. Nitrogen's presence means that a thunderstorm is developing. And I was not mistaken, lightning has started to appear near Marami's cliff which is only 600 meters away. A looming thunderstorm as nitrogen fog forbids me to go further. This has prompted me to hurry back down. Rains has made the steep trail down slippery as I am descending with the water gushing down the mountain. I had a share of falls during the descent. As I reached back to Mang Demy's hut at 3:30PM, from there I have met members of Meta Mountaineers to which they have also aborted their climb and decided to stay there overnight. Worrying about the thunderstorm, the safer area to stay is at the chapel back at the valley which is less likely to be hit by a lightning. I hurried down through strong rain and a muddy trail and gushing streams of water along it. The first time I experienced a tree being hit by lightning to which the distance from my back is only about 10 meters. I have reached the 2nd river by the back of the chapel at almost sunset at around 5:15PM. The water has now risen, murky, and the current is high. There is no way to get back due to the thunderstorm and rain and there is no way to stay as the river bank is rocky, muddy and wet. After several attempts to cross, I was successfully able to do so. The water that time is above waist high. The shallow 2nd major river as a deep and raging river as I got back. As I reach the chapel, it became my refuge overnight. It was still raining night-long and lightning is furious. Woke up at 5:00AM the next day. The rain has is not as strong as yesterday and so by 6:30AM, I hurried back to the jump-off. My concern was the river bordering Maragondon and Magallanes which could still be swelling. I was able to meet one local and is on the way back to Barangay Ramirez from his small hut near the river bank and followed him with his horse crossing the river. The river is almost waist-high and the current is strong but not as strong as the river at Mataas na Gulod yesterday. The 1st major river a bit deeper than yesterday but passable as I got back. At 8:30AM, I have safely reached the jump-off at Barangay Ramirez. There are 2 major jump-off to Mt. Marami. One is via Barangay Ramirez and the other one is Barangay Talipusngo. Barangay Talipusngo is the village before you cross the newly built Hadgan bridge of Magallanes if you are coming from Maragondon. The jump-off at Talipusngo is primarily used by 4x4 tractors and horse-drawn transport. It is wider than the regular trail at Ramirez although if using the Ramirez jump-off, you would still trek along this the last leg of this wide trail before you reach the Nuestra Senora Dela Paz chapel. Talispungo trail is longer for about 3 kilometers but the trail is easier to follow than Ramirez and is hot as it traverses on a grassland unlike Ramirez that is semi-grassland and forest. You would only cross one river which is the Nuestra Senora Dela Paz River but you have to cross it twice along this trail. 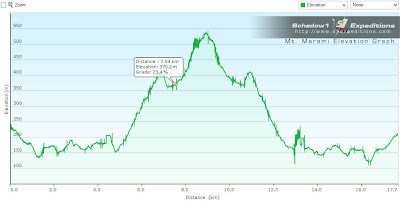 The waypoints and trail to Mt. Marami and Mataas na Gulod has been mapped and contributed to +OpenStreetMap Philippines as part of Schadow1 Expedition's advocacy. This is for use of mountaineers who would like to climb this mountain so there is more time to rediscover than getting lost.